When infection damages the nerves inside the teeth, the symptoms are easy to notice and often painful. But that’s a good thing, because untreated nerve damage can lead to severe pain and even tooth loss. Dental surgeons can fix the problem before it becomes serious, so knowing when you have nerve damage can help you avoid its complications. What is a tooth nerve? The oral cavity is made up of an average of 32 to 36 teeth. Each tooth has its own function: grinding, masticating, cutting, shearing, and so on. The tooth nerve is called and referred to as the dental pulp. It is a complex organ composed of connective tissues, blood vessels, and nerve axons. It is pinkish in color and soft in nature. Its original function is in the development of and formation of the teeth themselves. These nerves are relatively large at a young age, but they slowly shrink and become narrow over the years of adult life. They serve the purpose to keep the teeth hydrated and allow the dentin to retain a certain amount of elasticity. 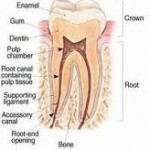 It lies within the tooth and extends from the crown to the tip of the root in the jaw bone. Is There a Likely Chance That the Tooth Nerves Will Die? When a root canal procedure is carried out, the dental pulp is removed as a whole and also in placements of dental implants. Existing periodontal diseases where due to the persisting infection will potentially contaminate and travel to the nerve or pulp. Once this occurs, the bacteria will eat its way through the nerve resulting in damage. The most common being a cracked tooth or damaged deep filling leaving the inner tooth structure more vulnerable to damage. Sensitivity maybe intermittent or constant depending on the severity of fracture. Physical irritation including severe decay wearing the tooth away down to the nerve. This infection may be secondary to tooth fracture or due to poor dental hygiene. In situations when an individual grinds his teeth or clinches the jaw in case of bruxism. Trauma from a blow to the tooth or jaw injures sensitive nerve tissue. This trauma can be due to sports, violence and accidents. Complications arising from third molars extraction, particularly long term symptoms but can also include any nerves lying near the surgical site. What are the nerve damage symptoms that one would likely suffer from? Damaged or dead pulp causes increased blood flow and cellular activity and pressure cannot be relieved from inside the tooth. Nerve damage symptoms are unbearable at times which can lead to fever. Pain occurs when it reaches the root tip and jaw bone is infected. It may start with a mild discomfort but if ignored can progress to a ‘pus-pocket’ and intense pain will be felt. Which tooth nerves are commonly affected? External traumatic injuries unless severe, do not cause dental nerve damage due to the thick, dense protection of the lower jaw bone. The most common nerve injured here is the inferior alveolar nerve. This may result in numbness, tingling sensation, pain and burning in one side of the face. If the entire nerve is affected, the symptoms may mimic the effects of a partial or complete numbness following a dental injection of local anesthetic, including tongue and lower lip. The condition is sometimes confined only to the lingual nerve supplying the tongue. In most cases, gradual regeneration of sensation in weeks or months may occur, otherwise, it may be a long term permanent damage. Healing of nerve injuries is usually slow process, with a reduction in intensity of the sensations and the size of the area affected. Care must be taken to avoid lip or tongue biting while eating. How to treat a damaged tooth nerve? Root canal treatment is the most essential mode of treatment together with a course of antibiotics to save the tooth. The absence of pain is not necessarily an indication that all is well with your teeth and absence of nerve damage symptoms. 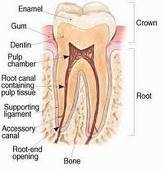 In a root canal procedure, the surgeon opens the top of the tooth (the crown), removes the infected tissue and flushes out the inside of the tooth. Medicament is then placed and the teeth sealed off. It is advisable to place a crown on this tooth as it is brittle in nature and tends to break away. If possible, it’s better to try to preserve your natural teeth. Extracting a tooth leaves a gap that can overstress or cause other teeth to shift. Root canal will help you avoid investing in a dental implant or bridge, both which can be very costly treatment. Practice good oral hygiene habits, brush and floss your teeth daily. Do not miss out visits to the dentist. If you experience these nerve damage symptoms, seek immediate treatment and care. This entry was posted in Endodontic treatment and tagged cracked tooth, Dental caries, root canal treatment, third molar, tooth extraction, tooth nerve damage on October 3, 2010 by suthalini. i have pain in my right eye….also my right lower jaw tooth paining…i want to know if my right lower jaw tooth causing pain in my right eye?